At the recently organised Sicily Ante Prima 2009 Assovini, an association of 65 regional wineries, there was as much debate about the vintage of 2009 as the new proposed appellation of DOC Sicily which its supporters feel will help improve the quality of wines. Subhash Arora reports. Sicily is Italy's largest region in terms of area (25,708 square kms) and fourth in population (5.1 million). Divided into 9 provinces - Agrigento, Caltanissetta, Catania, Enna, Messina, Palermo, Ragusa, Siracusa and Trapani, it has the highest acreage of vineyards, covering 164,500 hA of which only 21,000 hA are registered as DOC. Annual wine production of 11,000,000 hL, second to Puglia, includes only 1.5 per cent or 277,000 hL of DOC wines- out of which more than 95 per cent is white. Around 220,000 hL of this wine is DOC Marsala, a fortified wine which had lost a following in the last few decades but is making a comeback as dry wine. However, this does indicate that the quantity of DOC wine produced is very small. There is only one DOCG for red wine, Cerasuolo di Vittoria which got upgraded in 2005. It is made from the most popular Sicilian red grape Nero d’Avola and Frappato, an indigenous grape from the Sangiovese family, the blend of almost equal proportion. The most visible wine in the bottle is IGT Sicily, besides Vino d’Tavola. 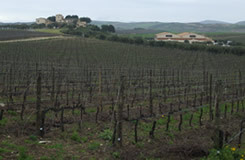 It may be produced from any Sicilian grown grapes- both international and indigenous varieties. This gives them a great flexibility, according to many producers who feel that Sicily is the ‘New World’ of the Old World. The Sicilian IGT wines must declare the year of harvest and generally also indicate the grape varietal on the label, making it easier for drinkers in choosing their wine, like the New World wines. ‘We love to break rules and experiment as much as we want,’ say most producers. The problem with the IGT Sicily wines is that the quality can be absolutely basic and unless the producer is known for his integrity and quality aspirations, one can never be sure of what’s in the bottle. Worse, the wine can be bottled in Germany, Piemonte, California or even India and be still known as IGT Sicily wine. Picking out an IGT Sicily can be a bigger gamble than betting on a number in roulette. Assovini had organised a lively debate at the Abby of San Francesco in Sciacca where over 30 producers sat facing the audience of journalists discussed and debated the issue while I was thinking that in India, the rules do not allow selling of wine within 200 meters from a temple. Diego Planeta, President of the Assovini was the moderator who steered the producers with dexterity. Earlier in the morning, Prof Attilio Scienza, the illustrious professor at the University of Milan, a universally acclaimed viticulture specialist threw some light at the 2009 vintage. 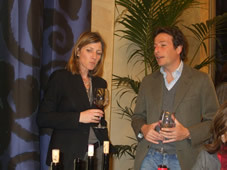 A tasting of wines from several producers had been organised the previous day at the Rocco Forte Verdura Golf and Spa Resort ‘sul mare’, fondly referred by many as the 5-star Alcatraz with its high, seemingly purposeless security at the entrance of the estate, miles away and due to its isolated location. 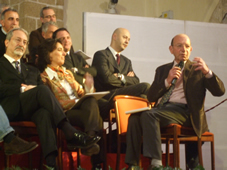 Diversity in unity in Sicily and its wines was the core message from Dr. Scienza. The biggest strength of the island is the different climates. It was an interesting revelation that the most popular Sicilian indigenous grape Nero d’Avola has several different clones that would give entirely different flavour even in the similar terroir. We would need to keep it in mind while discussing the DOC Sicily, a brand that could help enhance the image of the island, he said. Apparently, after 6 years of debates and discussion and one year of round table discussion, the majority have said yes to the proposed appellation-perhaps the first of its kind in Italy. The proponents claim that with IGT there is no control on quality and with DOC there will be some control and any violations can be checked. The topic is up for further discussion at Vinitaly next month and there is expected to be a public debate in April and May. However, no consensus is expected to be reached in the near future. The powerful co-operatives which have been controlling millions of liters of the industrial and bulk wine have enough clout to oppose the decision. Even many of the producers of the Assovini don’t see eye to eye on the issue. 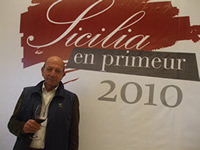 The only consensus that appeared to come out of the debate was from journalists who did not feel the issue had any international impact or ramification- though all agreed that Sicily had been improving its wine quality consistently during the last decade-especially from many of the producer members of Assovini. Similarly, there was not a significant interest in the tasting of tank/barrel samples of 2009, with the tasting room for blind tasting of this category practically empty most of the time. However, there was a lot of buzz in the big hall where one could taste wines with 38 producers at their table. One could meet Francesca or Alessio Planeta of Planeta or spend as much time as they likely with José Rallo, the charming owner of Donnafugata. Count Lucio Tasca d’Almerita or his son Alberto and taste and discuss their wines informally. Even Diego Planeta, President of the co-operative Settesoli and also Assovini was easily accessible. One could meet Franco Zuffellato who had specially come from Gambellara where the parent company of Principi di Butera, Zonin is located. Owners of Benanti, Cos, Fazio, Firriato, Fessina, Cusumano were there to discuss the 2009 vintage, DOC Sicilia or simply share the passion of their wines, region and terroir. With the presence of around a 100 wines available at each meal, one could enjoy the food and wines together with or without the presence of the producers. The wines were well represented- in terms of the grape varieties, terroir, producers- a rainbow with all its magnificent colours. 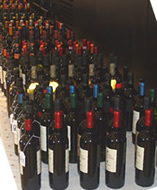 Even smaller producers like Cantina Barbera, Baglio del Cristo di Campobello and Etna Rocca d’Api rubbed shoulders with the colossal Feudo Arancio, owned by the Trentino based co-operative, Mezzocorona, showing as much passion and commitment to making wine the best they can and trying to make their wines express the terroir. At the end of the trip one could but exclaim; DOC or not- Viva Sicilia!